1. 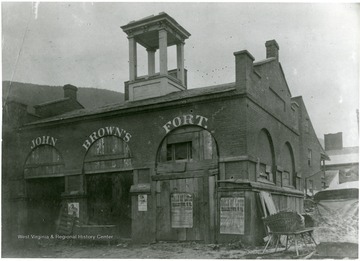 John Brown's Fort at Harpers Ferry, W. Va.
John Brown's fort, the Engine House of the U. S. Arsenal in Harpers Ferry, W. Va.
3. Monument and Historic Tablets on the Site of John Brown's Fort at Harpers Ferry, W. Va.
Monument and Historic Tablets on the Site of John Brown's Fort at Harpers Ferry, W. Va.
4. 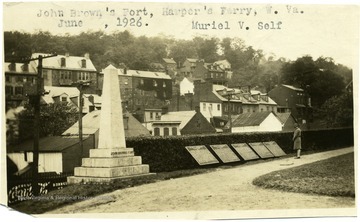 Monument and Historic Tablets on the Site of John Brown's Fort at Harpers Ferry, W. Va.
A woman reads the historic markers next to a monument to John Brown's Fort in Harpers Ferry, W. Va. 'Muriel V. Self." 5. John Brown's Fort at Harpers Ferry, W. Va.
Close up view of John Brown's Fort at Harpers Ferry, W. Va.
6. John Brown's Fort at Harpers Ferry, W. Va.
'The present site of John Brown's Fort as it now stands in a field overlooking the Shenandoah River in Va., a few miles from where it originally stood at Harpers Ferry. It was placed here at the suggestion of Kate Field of Washington, after it had been exhibited at the Worlds Fair in Chicago.' See West Virginia Collection Pamphlet 7514 for more information. 7. 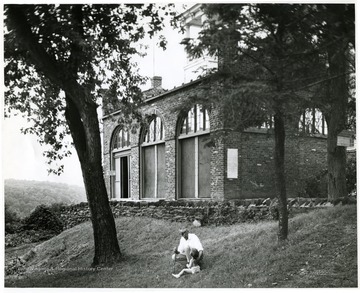 John Brown's Fort at Harpers Ferry, W. Va.
8. 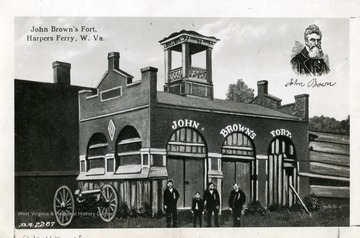 John Brown's Fort on Murphy's Farm, Bolivar Heights, W. Va.
John Brown's Fort on Murphy's Farm, Bolivar Heights, W. Va.
9. 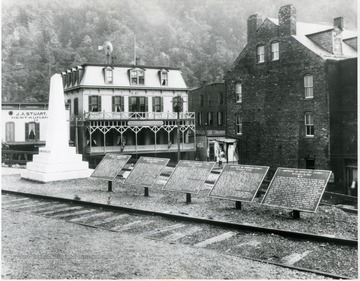 John Brown's Fort at Harpers Ferry, W. Va.
John Brown's Fort was used to store fertilizer in 1909. 10. 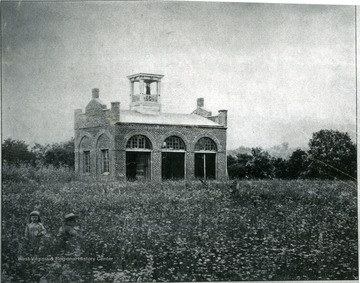 John Brown's Fort at Harpers Ferry, W. Va.
'In 1859 John Brown, Kansas Abolitionist, and a part of followers seized this little engine house which was at the time serving as a government arsenal at Harpers Ferry, W. Va. 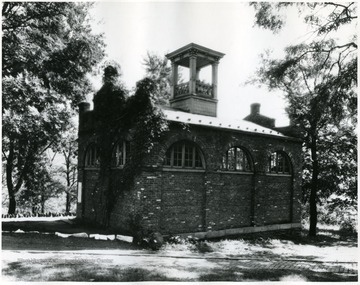 The fort was dismantled in 1892 and shipped to the Columbian Exposition at Chicago, Ill. 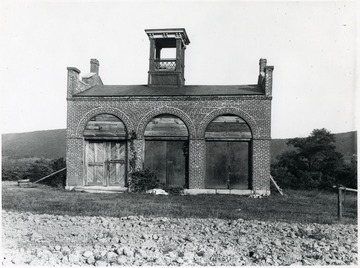 It was later returned to Harpers Ferry, where it is now being used as a museum on the campus of Storer College. This picture is an opposite side view of John Brown's Fort.' 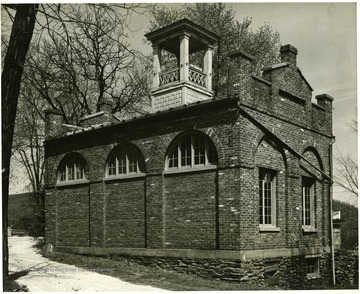 After this description was written and Storer College closed, the fort was moved back to the lower town near its original site. 11. 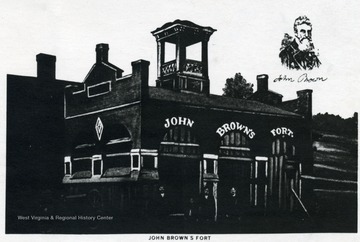 John Brown's Fort at Harpers Ferry, W. Va.
12. Downtown Harpers Ferry, W. Va. 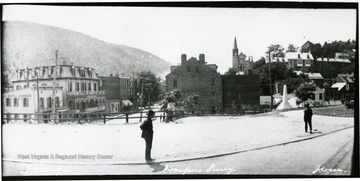 Downtown Harpers Ferry, W. Va.
Hotel Conner is on the left side of the picture. Site of John Brown's Fort is on the right.